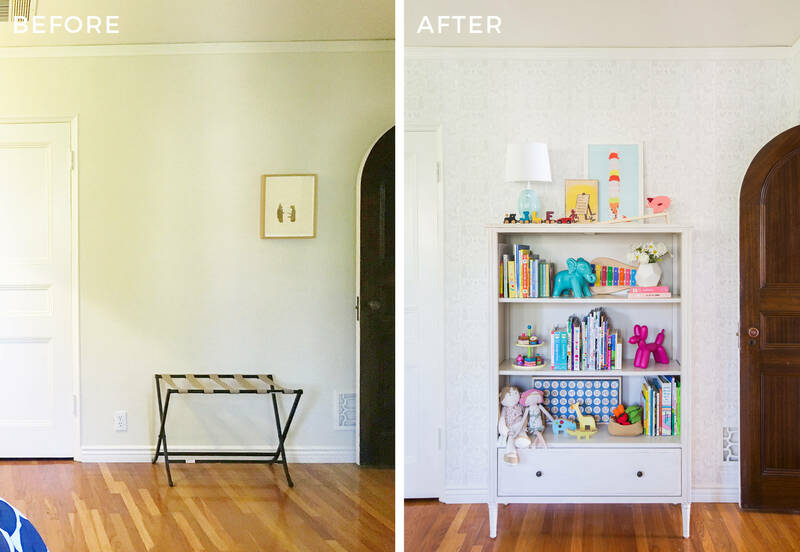 Hey all, it’s Ginny again with the final reveal of the cute transitional toddler bedroom I introduced a few weeks ago (click through in case you missed it). To our absolute delight, the clients wanted to do a wallpaper in here, so that was the first thing we tackled. They loved the idea of adding a subtle neutral pattern, that felt calm but fun, so we went with Nethercote from Hygge and West in gray. 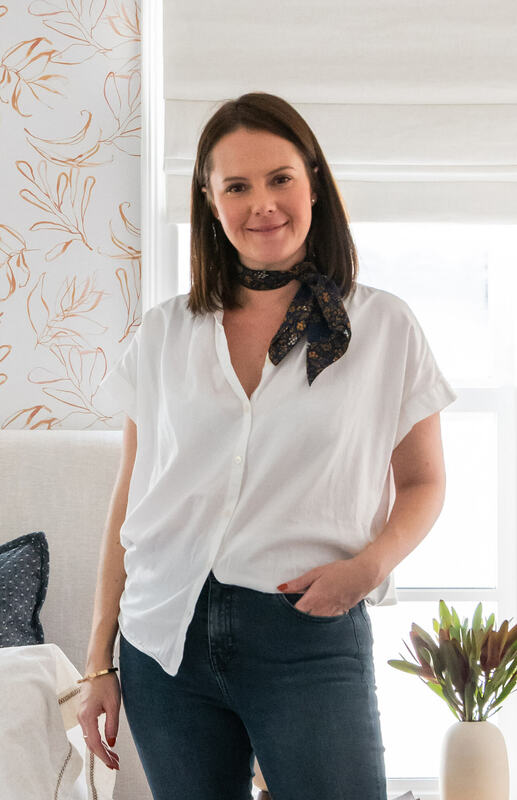 It looks so sweet in here and feels like a modern version of a traditional toile (which we did in the guest bedroom of this house). As described on their website, the pattern depicts a Northern English country home, with a sprawling manicured garden complete with deer and swans. Forget the kid’s room, now I want it for my bedroom!! 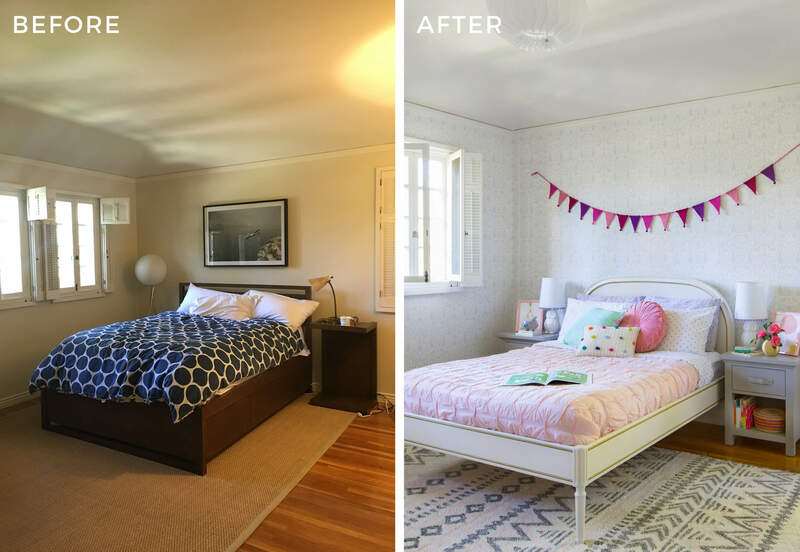 The family wanted their daughter to transition from her existing nursery to a big girl bedroom, and toyed between the idea of a twin bed vs a full bed. 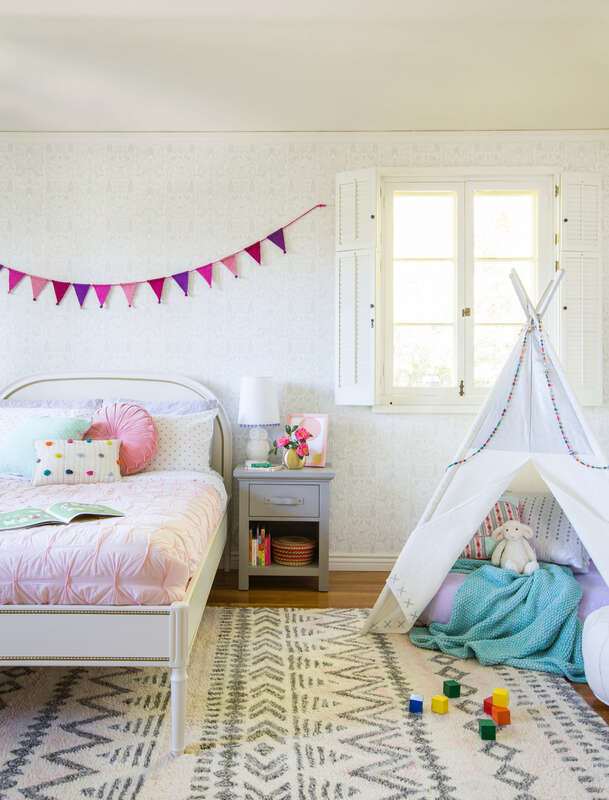 With this room being a space they envisage her growing into, they ultimately decided that a full bed would be better in the long run. They normally have protective stay put cushions on either side of the bed to stop her from falling out, but we obviously took those out for the shoot. The room is fairly large (for a toddler) so we decided to add two nightstands on either side of the bed to balance it out. 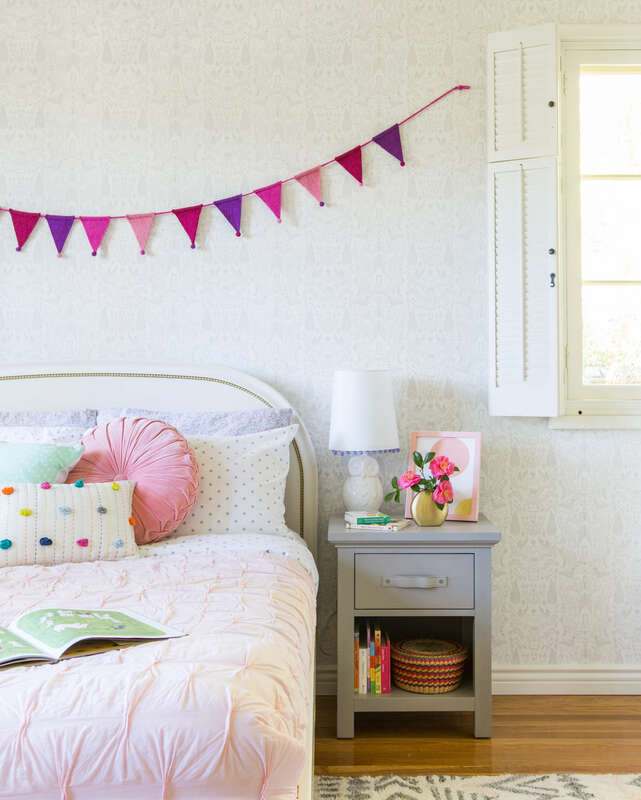 A little over the top for a kid’s room? Maybe. But when you have the room to do it then why not?! It also means that when she’s older she has a space to hide her diary and other things from her parents… well that’s what I used to do at least. 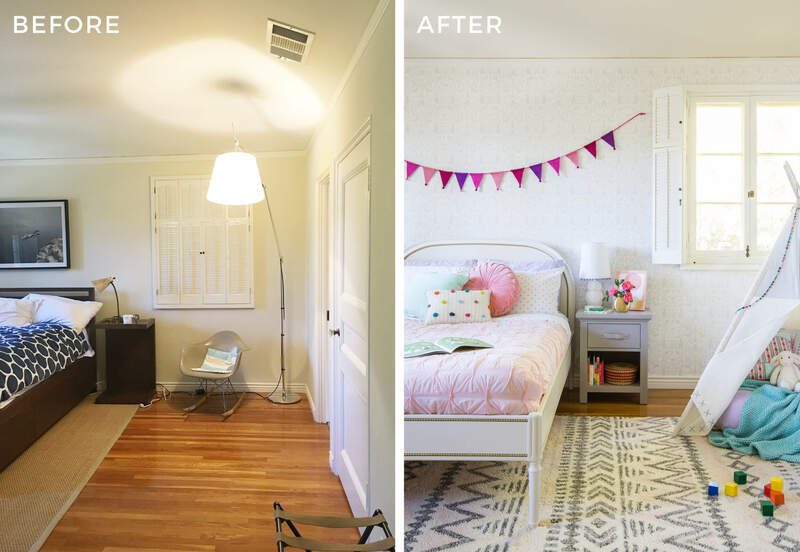 The lamps started to feel too white and blend in with the wallpaper, so we added a lavender ball fringe to the inside to give it a pop of color. 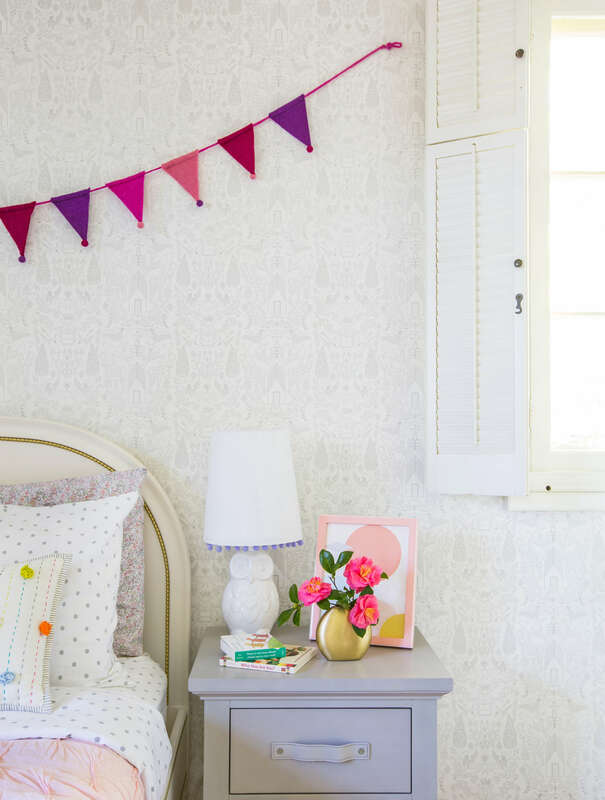 There’s no real need to get overly fussy when styling kid’s nightstands, mainly because they’ll not stay like that for more than 5 minutes. 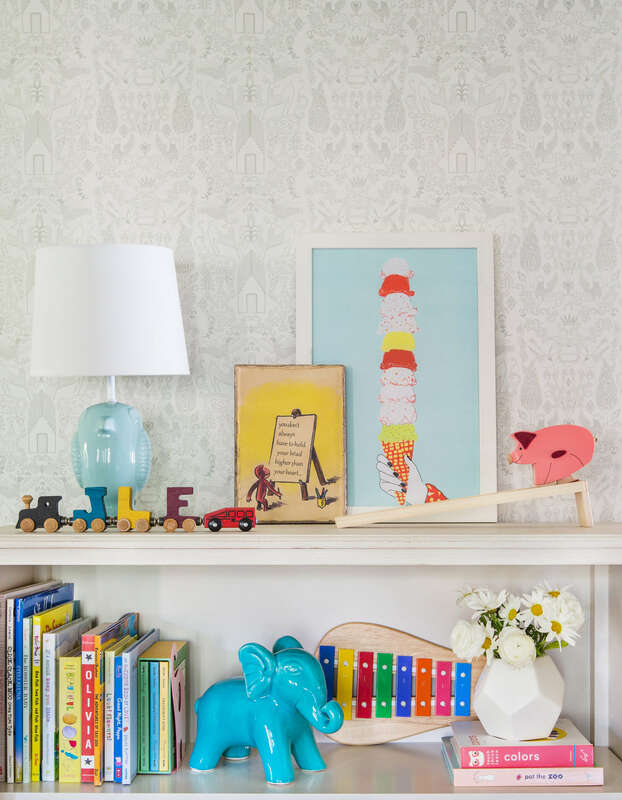 For everyday use we installed the lamp and artwork (to add more color) and then the wicker basket with books on the lower shelf. For the sake of the shoot we added flowers to bring in some life. They already had the play tent in the corner, so to make it feel more fun we dressed it up by adding some string beads to the top. She often reads and takes naps in there so we added lots of soft, colorful blankets and pillows which makes it feel super cosy. This rug has been a huge hit since we installed it. It’s super plushy and soft under your feet so it’s perfect for little ones playing. It does shed a bit so if you buy it just make sure you keep vacuuming the heck out of it when you get it. It’s 100% wool which has a tendency to shed more than synthetic fibers. The window shutters are original to the house, so once we found out that they’d be easy and affordable to re-paint, we decided that’s all the room needed. They already provided great black-out (which I’m told is crucial for kids sleeping) so adding drapery, albeit a nice idea, didn’t seem necessary. It would also cover up some of the wallpaper and since there isn’t a ton of wall space (due to doors and windows), and we knew we’d add art, we wanted to make sure that we got the most out of seeing the pattern. This bookcase is as much storage as they need in here. There’s already two built-in closets in the bedroom: one is a walk-in with hanging storage and shelf space, and the other has a ton of built-in drawers. So they really didn’t need, or want a free-standing dresser at all. 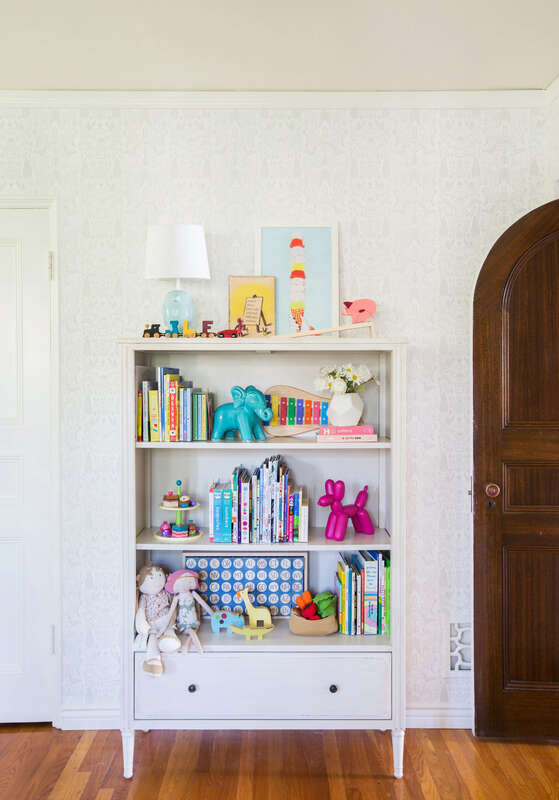 The bookcase is purely for her to store books and toys (which we obviously styled out for the shoot) and helps to bring in height to the room. For this type of bookcase (with large spaces between the shelves) I’d encourage you to invest in some good bookends to stop books from toppling over. We’ll be doing a cute styling gif of this bookshelf on other social platforms so be sure to look out for that. Although the bookcase added height in the room it wasn’t that overpowering, and therefore gave us another opportunity to add a lamp and some artwork on top. This helped to bring in more color and sculptural elements to the room. The family loved the idea of having a little settee in here so they could sit and read books with her. This settee came with a darker contrasting grey seat pad, that we recovered in some of the leftover pink fabric from the playroom sofa. The wall above was a place where we could add some more color and introduce some artwork. 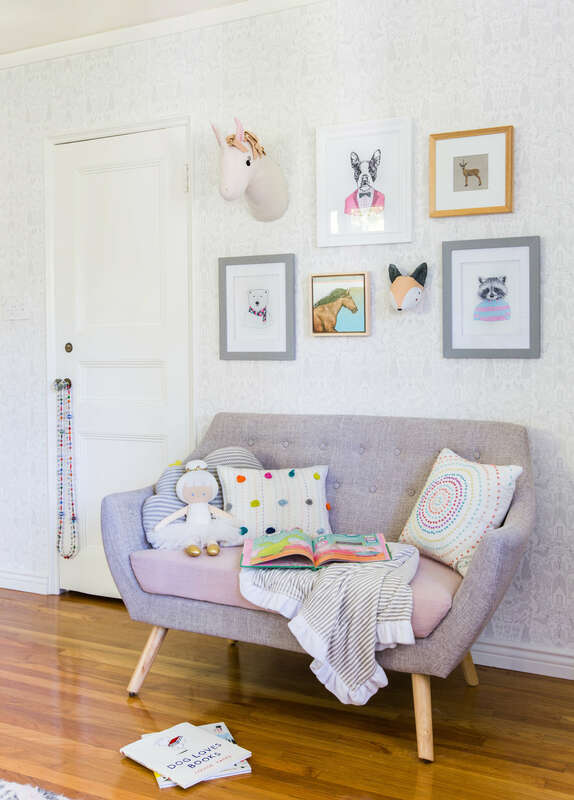 We created a mini gallery wall with a mix of prints, paintings and fabric art showcasing different animals. The raccoon literally kills me every time with his cheeky grin and stripy jumper. 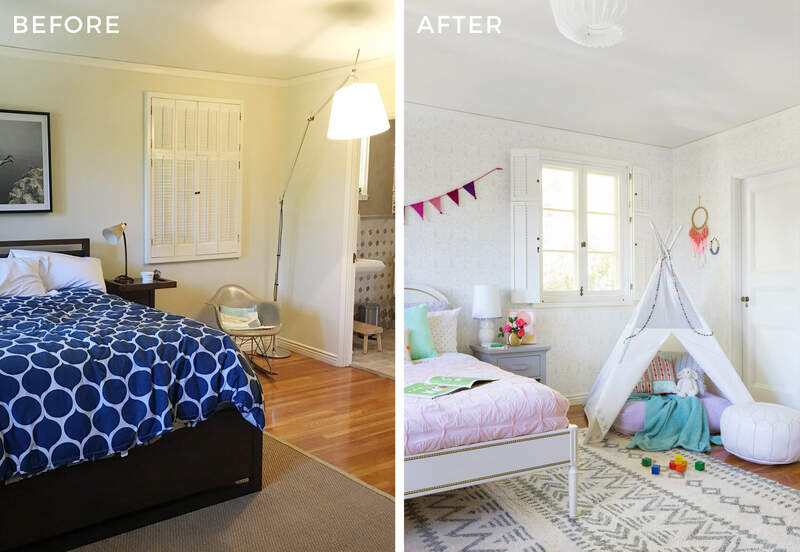 If you like what you see and fancy recreating the look for your own littles ones, we’ve included a ‘get the look’ as well as some before and after photos below.